Charlotte Hartley in Science & Technology on 5 February, 2019. I wasn’t raised in a house of scientists, but I was lucky enough to grow up with access to bookshelves lined with engaging, accessible popular science books. Now in the final year of my undergraduate degree, I can look back and credit some of the books I read in my adolescence for piquing my interest in Biology and ultimately influencing my decision to pursue it at university. Good popular science should be clear and comprehensible to the general public, meaning not just those with a further scientific education. It is intended to straddle the gaps between primary scientific literature and wider societal dialogue. Above all, whether inspiring the next generation of scientists, or simply providing an enjoyable non-fiction read, popular science books should be entertaining as well as informative. Probably the most famous book on evolution, ‘The Selfish Gene’ has sold over a million copies worldwide since its publication in 1976. Selfish gene theory describes the idea that evolution is powered by genes and their inherent drive to replicate, with individual organisms, populations, and species simply vehicles for their journey. Despite use of the word ‘selfish’, this can explain all sorts of phenomena from altruism and cooperation, to cooperative breeding and eusociality. While he’s perhaps best known nowadays for an overly excessive distaste of religion and for getting into arguments on Twitter, Dawkins did some of his best work in ‘The Selfish Gene’. It was revolutionary and controversial and has been credited with bridging the gaps between mid-20th Century theoretical evolutionary biology work and the modern genomic era. On a personal level, this book sparked an ongoing fascination with evolutionary biology and behavioural ecology. I’m sure it will remain a staple in the personal statements of hopeful Biology undergraduates for years to come. 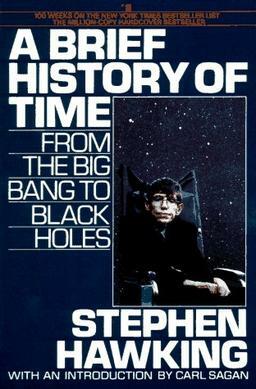 The front cover of A Brief History of Time written by Stephen Hawking. Hawking’s cosmology classic has been widely praised for its articulation of advanced concepts in coherent terms for non-physicists – famously dropping all but one equation (E = mc2) from the original draft. With the intention of bringing his academic research to the masses, Hawking writes eloquently about a wide variety of sub-topics, including the historical study of astronomy; black holes; the Big Bang and fate of our expanding universe; and the Heisenberg uncertainty principle. ‘A Brief History of Time’ argues the need for and predicts the imminence of a ‘unifying theory’ of theoretical physics, which would explain the entire workings of the universe. This ‘theory of everything’ would link the two central, but currently deemed incompatible, theories of modern physics: general relativity and quantum field theory. Despite the complex subject matter, Hawking’s first popular science book was a huge commercial success: it became a worldwide #1 bestseller and sold out in the US within days. ‘Bad Science’ is a critical discussion of the ways in which the mainstream media reports on science and medicine-based stories. Goldacre argues that the press and public generally have a poor understanding of basic science, with a limited ability to evaluate scientific claims based on actual evidence. He tackles a number of controversies, from the supposed healing properties of homeopathy, to the MRSA ‘superbug’ scare, to Gillian McKeith. Each issue is given a brief overview and any scientific claims are dissected in the light of peer-reviewed, evidence-based studies. Goldacre partly credits the common misunderstanding of scientific issues with the prevalence of arts and humanities graduates dominating journalism. He also complains of widespread oversimplification of science, in order to make for more sensationalised, emotion-inducing headlines. ‘Bad Science’ has been widely critically-appraised and became a Top 10 bestseller. Since its publication, Goldacre has continued to blog about common science misconceptions and misrepresentations for anyone interested in even more stories of terrible science. A highly influential evolutionary biologist and palaeontologist, Gould wrote several acclaimed popular science books before his death in 2002. ‘Wonderful Life’, a book about the magnificent findings of Cambrian fauna in the Burgess Shale, probably could have also made this list, but ‘The Mismeasure of Man’ is Gould’s most famous and culturally significant publication. Gould argues in staunch opposition of biological determinism – the belief that socio-economic differences between different classifications of humans are the result of inherited, biological factors. He harshly criticises use of craniometry and psychological testing as measurements of intelligence, writing that they “invariably [find] that oppressed and disadvantaged groups – races, classes or sexes – are innately inferior and deserve their status”. Gould’s allegations that much early research on intelligence was subject to unconscious methodological errors, due to the researchers’ existing racial and social bias, was controversial. A 2011 paper argued that Gould’s arguments equally were influenced by his own opposition to racism; Gould was a passionate supporter of the civil rights movement from a young age, having organised protests in Leeds during the early 1960s. Since then, however, reviews of the paper have maintained that Gould’s claims were indeed accurate. 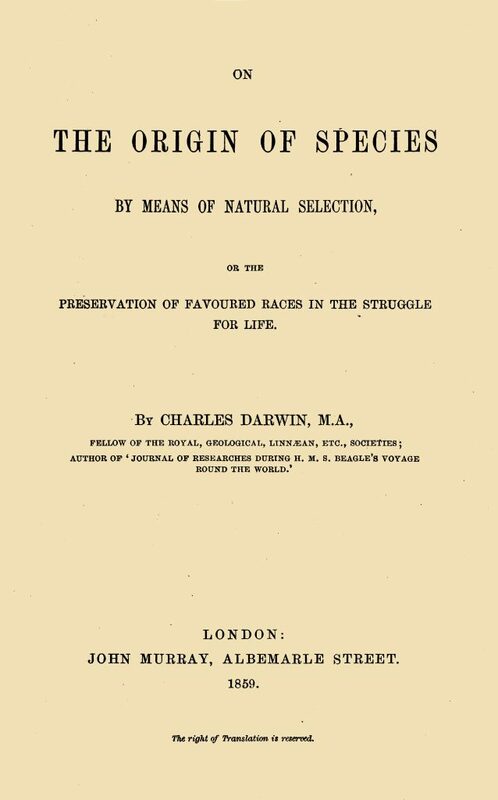 The original front cover of On the Origin of Species by Charles Darwin. In November of this year, the book that revolutionised the study of life will celebrate its 160th anniversary. Darwin’s theory of evolution by means of natural selection is the idea that populations change and species evolve over time due to preferential survival of some individuals over others. ‘On the Origin of Species’ describes explanatory examples of selection, such as selective breeding of pigeons, in somewhat meticulous detail. But it also contains some illustrative and, in my opinion, quite beautiful language of “entangled banks” and the “grandeur in this view of life”. While popular science in the way we recognise it now wasn’t really a thing in the mid-19th century, ‘On the Origin of Species’ was written for non-experts and provoked widespread scientific and religious discussion. The classical Darwinian view of natural selection has been built on over the years as our knowledge of the mechanisms behind selection and fitness has improved. Nonetheless, Darwin’s initial concept remains the central unifying theory of Biology, in the context of which all biological issues are viewed.